Well, those pesky Zeons are trying to take over the Earth again, and when they aren’t jumping about in Mobile Suits (Gundam), they are flittering around in neat little hovercraft like this thing! Two large fans and some bouncy legs make this little scout craft look like a katydid mated with a bathroom fan, but it does have a gun, ala 1942 luftwaffe style, having to be fired by the pilot while doing the piloting. You would have think the Zeons could have made a button on the collective stick or something. Once again, Bandai has really produced a winner of a great science fiction model, this being one of the “U.C. 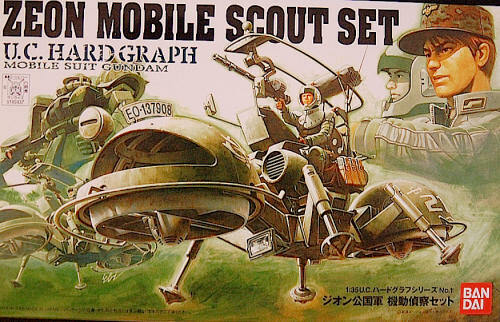 Hardgraph” series in 1/35th scale. The fit looks to be impeccable, and some of the sprues are formed in multi-colored fashion, in case you need to get your play time in quickly, without all of the fuss of painting and what-not. Decals appear to be in register, though a bit thick, and the markings are general for a number of standard combat aircraft, and also for the Zeon Armored Assault Force (sort of like the Gestapo). The figures that are included are somewhat wooden, but fit perfectly in the anime universe, and have quite natural poses. The pilot is meant to be firing the machine gun, while the commanding officer is busy checking his watch or something, I gather these Zeon types are a little irregular? The kit has zero flash, and should work well with any sci-fi dioramas you may have in mind.